If you're looking for the My Creative Time Blog Hop, just scroll down to the next post. A friend of mine asked if I would make a card for her mom. She and her brothers are giving her the gift of a new patio, and they needed a card to let her know about it. This is a 6" square card. I first printed a 5.5" square of cloud patterned paper from the Best Friends cartridge on the Imagine. The tree is cut at 5", using the Imagine More cartridge for the green gingham pattern. The table, cut at 2.65", is from the Camp Out cartridge, and the grill, cut at 2.3", is from the From My Kitchen cartridge. 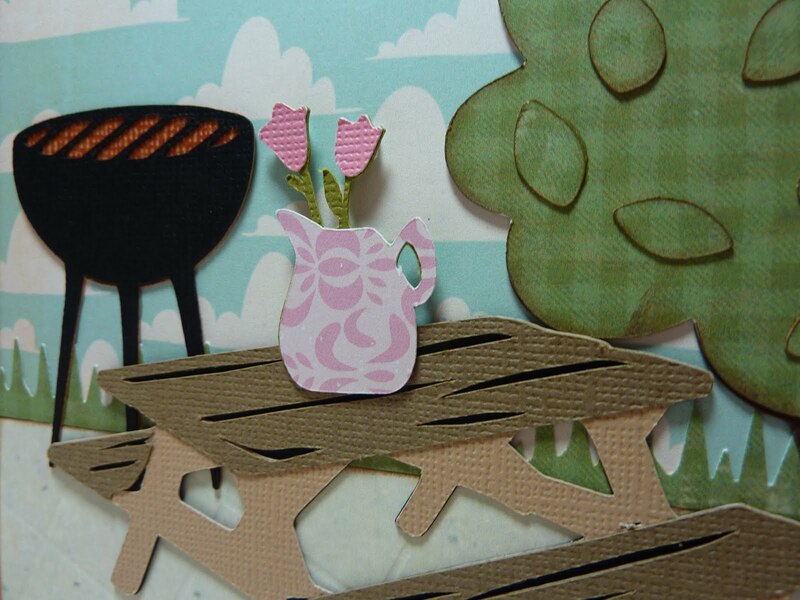 Lastly, I cut the flowers in the vase at 1.5" from Kate's ABCs. To make the grass, I printed a rectangle with the same Imagine More pattern, and then trimmed it with my Martha Stewart Icicle Punch. I didn't have any good paper for a patio, so I searched online and found some free printables at "Outdoor Fun Scrapbook Graphics." I just used my Scor-Pal to make it look like tiles. Love the card! It reminds me that spring is here! Finally! I am so glad we can use more than one cartridge when designing a card. I also love my imagine because I don't have to worry about running out and getting paper. Anyway - Great job! Great card..Makes me look forward to some warmer weather! What a cute card.....I love cards made like this you really out did yourself....your detail is awesome...I'm so glad for this blog hop or I would not have even been here but I am signing up for your e-mails....can't wait 2 C more of your talented project. I am so thrilled to have a chance to win the stamp set....wow..exciting! Beautiful card! Hope I win! What a nice thing to do for your friends Mom! I love this and so many wonderful details! This is an absolutely gorgeous card. All the details are great!!! way too cute! I tried the link for outdoor graphics and it didn't go anywhere. great idea for the cement/tiles! Love the new stamps from My Creative Time - hope to win. Oh my! Your card is just incredible! All of the details are just AMAZING! I love the patio, the tree, the bench... the everything! Everytime I come over here you just blow my mind! 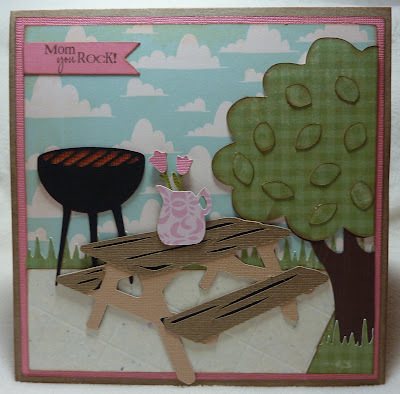 Love the "Mom you rock" stamp. Great! This is so cute! I love scenery type layouts! I think these pages are great. Cannot wait to CASE them. SO flippin cute...LOVE LOVE LOVE It!!! Wow. What a lucky person...a patio set and a great card. Love all the details. Wow! What a beautiful card with beautiful cuts. Thanks for sharing! Such a cute card, she is going to love it!